The Labino Apollo 2.0 UV & Visible Light Meter for accurate measurement of UV-A radiation and White Light emissions. Wireless Radiometer and Photometer in one instrument - small enough to fit in a pocket. Labino Apollo 2.0 Meter - M505 Measures UV and Visible light via a wireless sensor Radiometer and Photometer in one instrument - small enough to fit in a pocket. Labino Apollo 2.0 Radiometer/Photometer is an instrument for accurate measurement of UV-A irradiation and visible illumination. Extra engineering effort is taken to make an accurate measurement of visible light emission from a UV-A lamp by incorporating a superior band pass filter stack containing only non-fluorescent filters. The instrument provides fast measurement as it offers auto ranging and concurrent measuring of visible light and UV-A irradiation. Apollo 2.0 is traceable to NIST, SP & ISO 3059. Wireless Sensor via Blue-tooth Sensor measurements and transmission of data is done via Blue-tooth. This enables the user to measure from a distance of up to five meters. This feature ensures that the sensor unit is stable and no movement occurs from connecting cables during measurement. Light and Compact The Apollo 2.0 Meter is ergonomic and easy to use due to its light weight chassis, wireless sensor unit and compact size. The reader unit weighs 194 grams (6.84 oz) and the sensor unit 100 grams (3.53 oz). The dimensions of the reader unit and the sensor unit are 145 x 89 x 25 mm and 108 x 68 x 23 mm respectively. Advantages Over Traditional Meters A. WIRELESS: Sensor measurements and transmission of data is done via blue-tooth. The wireless sensor enables the user to measure from a distance of up to five meters. This feature ensures that the sensor unit is stable and no movement occurs from connecting cables during measurement. B. CALIBRATIONS NEED NOT DISRUPT YOUR OPERATIONS: A user can buy a double kit (1 reader, 2 sensor units) and only send one sensor for calibration, while making use of the other, so that operations are never disrupted. Each sensor unit has both a UV and White light sensors incorporated within it. C. EASE OF USE: The Labino Apollo 2.0 Meter is ergonomic and easy to use due to its light weight chassis, wireless sensor unit and compact size. The back light in the display comes on automatically when measuring in a dark area and it provides an auto ranging for visible light and UV light simultaneously. The meter features both hold and peak functions. • Hold function: By pressing the Hold button the present value is stored. • Peak function: By pressing the Peak button the sensor automatically stores the highest value measured. Labino Olympos Measurement Stand Part No: A542 Over recent years the NDT industry has adopted new standards for LED blacklights, authored by ASTM (i.e. ASTM E3022-15) and the PRIMES (i.e. Rolls-Royce RRES 90061, AIRBUS AITM6-1001), to ensure that the properties and quality of the UV Lights used are suitable for NDT inspections. Labino has in its product portfolio UV Lights that are tested to comply with all relevant ASTM, ISO and PRIMES requirements. The aforementioned requirements as the various check-lists of NDT Technicians (i.e. NADCAP) require frequent tests and measurements of the UV Lights from a distance of 15 inches (38cm). 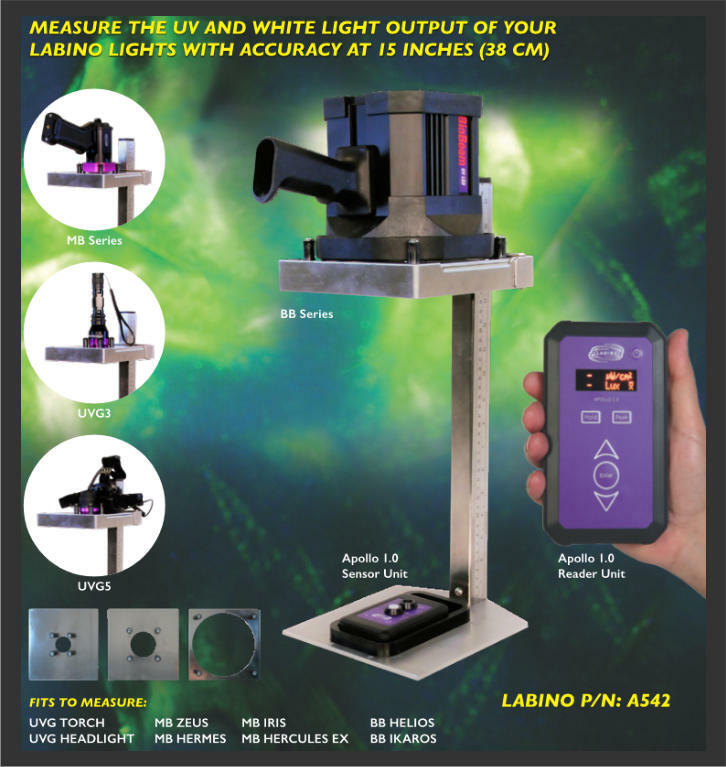 Labino are proud to introduce to the market the first measurement stand for UV lights, OLYMPOS, especially designed to conduct measurements from a distance of 15 inches (38cm) and help NDT professionals to remain in compliance with the pledged standards. The Labino Olympos measurement stand comes with different size plates. 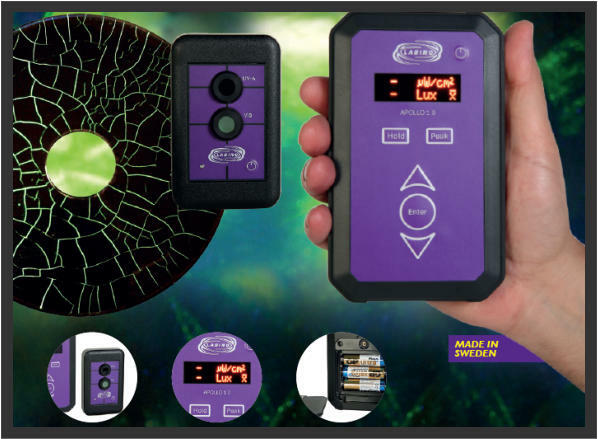 This enables all Labino LED blacklights (UVG Series, MB Series, BB Series) to be measured from the same distance using the Labino Apollo 2.0 UV and White light meter or any other meter.